Size: (Large) is currently out of stock! Size: (Small) is currently out of stock! Gotta go fast? Transform yourself into a real speed demon this Halloween with the Sonic Mens Costume. Zip your way through the Emerald Zone otherwise known as your neighborhood and show Mr. Eggman a thing or two with the help of this video game inspired outfit. 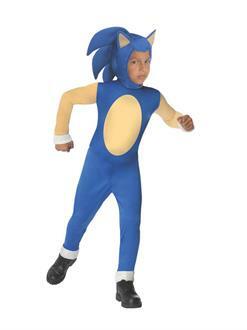 It comes with a blue Sonic the Hedgehog jumpsuit with attached headpiece and authentic detailing designed to please Sonic fans. Getting this costume is a whole lot easier than finding the Chaos Emeralds so what are you waiting for?